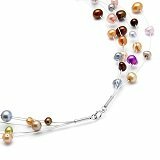 Established in London, in 1992; Kyoto Pearl’s identity is about connecting women from around the world with classic, affordable and genuine freshwater pearl jewellery. With each individual piece of our jewellery finished by hand, using the most premium quality materials and with over twenty-five years’ experience within the pearl industry. This ensures that only the highest quality pearls are cultivated and sold through us. To top this off, our pearl experts have undertaken the internationally recognised Gemological Institute of America’s Pearl Grading program. Through this program our pearl experts are trained in the art of identifying the beauty, value and quality of genuine pearls. Over the years, Kyoto Pearl has experienced phenomenal growth becoming one of the leading pearl jewellery suppliers in the UK and international stage. Our roots may be British, but today we’re truly a global brand. Currently we can be found in over 50 countries throughout the world including USA, Canada, France, Germany, Spain and Australia. We partner with some of the best retailers globally and are across a range of retail channels such as online, traditional bricks and mortar and premium duty-free markets.